dental assistant a specially trained health care worker who provides direct support to the dentist. An educationally qualified dental assistant may be delegated to do intraoral procedures that do not require the professional skill and judgment of a dentist. Although not all states require formal education for dental assistants, minimum educational standards include a program of approximately one academic year. Dental assistants may take the Certification Examination administered by the Dental Assisting National Board and earn the title of a Certified Dental Assistant (CDA). Some state boards of dentistry register dental assistants (RDA) after completion of a state-administered examination. Dental assistants may be members of their professional organization, the American Dental Assistants Association (ADAA), whose address is American Dental Assistants Association, 203 N. LaSalle St., Chicago, IL 60601.
dental caries a process of demineralization of tooth enamel, leading to destruction of enamel and dentin, with cavitation of the tooth. Decayed and infected teeth can be the source of other infections throughout the body, and decayed or missing teeth can interfere with proper chewing of food, leading to nutritional deficiencies or disorders of digestion. Called also tooth decay. Causes. The causes are not completely understood, but certain facts are known. Tooth decay seems to be a disease of civilization, possibly associated with refined foods. Lack of dental cleanliness is also closely associated. Decay occurs where food and bacteria such as Lactobacillus species and Streptococcus mutans adhere to the surface of the teeth, especially in pits or crevices, and form dental plaque. It is believed that the action of the bacteria on sugars and starches creates lactic acid, which can quickly and permanently dissolve tooth enamel. The acid produced in just 20 minutes after sugar comes into contact with plaque is enough to begin this process. In most people this occurs whenever sweet foods are eaten; thus, eating of sweet or starchy foods between meals or at bedtime can be harmful to the teeth unless they are thoroughly brushed and rinsed immediately afterward. Decay that is not treated will progress through the enamel and dentin into the pulp, which contains the nerves. When it reaches the pulp, it can cause intense pain. There is no relief until the pulp dies or is removed or the tooth is extracted. Treatment. The treatment for tooth decay consists of elimination of the pathogenic microorganisms that cause it, along with regular dental care. Enamel that has been destroyed does not grow back. The decay must be removed and the cavity filled. fillings (or restorations) may be of gold foil, baked porcelain, synthetic cements, silver amalgam, or cast gold inlays. When decay has reached the pulp, formerly extraction was usually necessary. Whenever possible, however, the exposed pulp is re-covered, or capped, and the tooth is then filled. New techniques of root canal therapy are saving many teeth that would formerly have been lost. Flossing and Brushing the Teeth. Cleanliness is the best weapon against caries and periodontitis. Bacteria and food particles must be removed before the enamel is penetrated. This means thorough brushing regularly each day, preferably after every meal. If it is impossible to brush after every meal, it is helpful to rinse the mouth by swishing water vigorously back and forth between and around the teeth. When the teeth are brushed, food particles that lodge between the teeth should also be removed with dental floss. The dental floss should be strung tightly between the two index fingers or between the bows of a floss holder. Flossing and brushing should be done in an orderly sequence so that no area is neglected. The usual pattern is beginning at the upper right, progressing to the upper left, and then from the lower left to the lower right. The floss is gently inserted between the teeth and pulled against the surface of one tooth to a point slightly under the tissue of the gum. It is then moved up and down for several strokes. The adjacent tooth is cleaned in the same manner. The “sulcular” technique for brushing the teeth is so called because the bristles of the brush are worked beneath the free gingival margin and into the space between the tooth and the gum (the sulcus). To accomplish this the bristles are placed at a 45 degree angle to the gum line. Pressure is then used to move the brush back and forth in a circular motion. The brushing is continued around the mouth in the same pattern as the flossing. Proper Diet. In order to help maintain healthy teeth, the diet should include all the essential elements of good nutrition. Tooth decay can be reduced by limiting the intake of certain forms of sugar, especially the rich or highly concentrated ones such as in candy or rich desserts. fluoridation is another important means of preventing caries. Many communities whose water is lacking in an adequate natural supply of fluoride add the chemical to their water supply. In communities that do not have fluoridation, dental professionals may add a fluoride solution directly to the teeth or may suggest other means of obtaining fluoride protection. Correction of Malocclusion. Another factor leading to tooth decay is malocclusion (poor position of the teeth), which results in faulty closure of the jaws and uneven meeting of the teeth. This should be corrected early because it also can lead to inadequate nutrition because of difficulty in chewing, and if it is severe enough to distort the face, it may have psychologic effects. a localized, progressively destructive disease of the teeth that starts at the external surface (usually the enamel) with the apparent dissolution of the inorganic components by organic acids that are produced in immediate proximity to the tooth by the enzymatic action of masses of microorganisms (in the bacterial plaque) on carbohydrates; the initial demineralization is followed by an enzymatic destruction of the protein matrix with subsequent cavitation and direct bacterial invasion; in the dentin, demineralization of the walls of the tubules is followed by bacterial invasion and destruction of the organic matrix. 1. The formation of cavities in the teeth by the action of bacteria; tooth decay. 2. (used with a pl. verb) Cavities in the teeth formed by such action. a tooth disease caused by the complex interaction of food, especially starches and sugars, with saliva and the bacteria that form dental plaque. The term also refers to the tooth cavities that result from the disease. Plaque bacteria produce acids that cause demineralization of enamel and enzymes that attack the protein component of the tooth. This process, if untreated, ultimately leads to the formation of deep cavities and bacterial infection of the pulp chamber, which contains blood vessels and nerves. The development of dental caries in a debilitated patient is a concern because of the danger that infections of the teeth or gingival tissues may spread to the rest of the body. In addition, teeth that are decayed or painful inhibit mastication and can lead to dietary changes, which may in turn cause nutritional and digestive disorders. 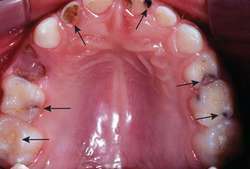 Dental caries may be prevented by a reduction in the frequency of sugar consumption, use of dental floss between the teeth, regular brushing of the teeth with a fluoridated toothpaste, drinking of fluoridated water, topical application of fluorides to the teeth, and removal of plaque and calculus by a dental hygienist. Treatment of dental caries includes removal of the decayed material and restoration of the surface of the affected tooth with a silver amalgam or other restorative material. If the cavity has reached the pulp chamber, it may be necessary to remove the pulp tissues to alleviate pain, prevent the spread of infection to the rest of the body, and allow the continued use of the tooth. Alternatively, the entire tooth may be extracted. Kinds of dental caries include arrested dental caries, incipient dental caries, pit and fissure cavity, primary dental caries, secondary dental caries, smooth surface cavity. See also classification of caries. carious, adj. Localized, progressively destructive tooth disease that starts at the external surface (usually the enamel) with the apparent dissolution of the inorganic components by organic acids that are produced in immediate proximity to the tooth by the enzymatic action of masses of microorganisms (in the bacterial plaque) on carbohydrates. the decay and crumbling of teeth caused by demineralization of tooth enamel; it is one of the most common diesases in the world. The condition arises when dental bacteria form acids from the breakdown of sugars in the diet. Resistance of the enamel to acid attack can be enhanced by the application of toothpaste and mouthwashes containing fluoride salts and by the fluoridation of drinking water. A disease of the teeth in which microorganisms convert sugar in the mouth to acid, which then erodes the tooth. Localized, progressively destructive disease of the teeth that starts at external surface (usually enamel) with the apparent dissolution of inorganic com-ponents by organic acids produced in immediate proximity to tooth by enzymatic action of masses of microorganisms (in the bacterial plaque) on carbohydrates; initial demineralization is followed by an enzymatic destruction of the protein matrix with subsequent cavitation and direct bacterial invasion; in the dentin, demineralization of the walls of the tubules is followed by bacterial invasion and destruction of the organic matrix.